What would ‘church’ look like if we began to follow the model that Jesus and his disciples set for us? What would ‘church’ look like if we began to intentionally blur the lines we have drawn between worship, fellowship, and growing as disciples? What would ‘church’ look like if we allowed our worship and ‘disciple-ing’ to flow from us as a natural result of our intentionally living life together as the people of God? What would ‘church’ look like if we intentionally removed the boundaries we have set in place that serve to divide us by age? What if ‘church’ was more ‘organic’? Have you ever wondered? Have you? Come and explore and discover what ‘church’ could look like. 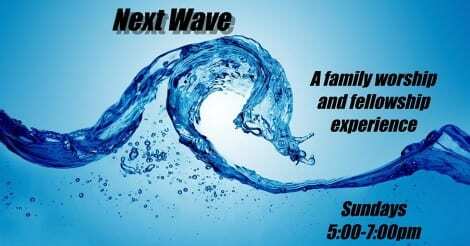 Please join us Sunday evenings from 5:00 p.m. to 7:00 p.m. for ‘Next Wave,’ a new organic and intentionally integrated worship/fellowship/discipleship experience!